If you've never made homemade marshmallows before, this is your chance! You only need about half a batch for the cake, so the rest are left for snacking. Also, they can be made a few days in advance. So you can make the marshmallows one day, mix up the frosting, and then the next day all you have to do is bake the cake and assemble. Easy peasy! So since today's Tuesday, you can start this cake on Wednesday or Thursday, and have it ready for Christmas Eve or Christmas Day! Combine the cream, butter, and vanilla bean and seeds in a 4-quart saucepan over low heat and stir until the butter is melted. Remove the vanilla bean and whisk in the chopped chocolate until melted. Whisk in the sugar, cocoa powder, syrup, and salt until smooth—be sure the cocoa powder dissolves completely. Pour into a 9x13-inch pan and freeze until firm, about 2 hours, or refrigerate overnight. Position racks in the bottom and top thirds of the oven and heat the oven to 350°F. Butter three 9-inch round cake pans and line each with a parchment round. Butter the parchment, then dust with flour and knock out the excess. In a 3-quart saucepan, combine the butter, oil, chopped chocolate, and coffee. Heat over medium heat until melted. In a large bowl, whisk the flour, sugar, and cocoa powder. Pour the hot chocolate mixture into the sugar mixture and whisk until combined. Whisk in the eggs, one at a time, then whisk in the buttermilk, vanilla, baking soda, and salt. Divide the batter evenly among the prepared pans. Set two pans on the top rack and the third on the lower rack. Stagger the pans on the oven racks so that no pan is directly over another. Bake, swapping and rotating the pans’ positions after 20 minutes, until a toothpick inserted in the center of each cake comes out clean, 35 to 40 minutes. It is possible for them all to be done at varying times. Cool on racks for 10 minutes. Invert the cakes onto the racks, remove the parchment, and cool completely. Lightly spray a 13- by 9- by 2-inch rectangular metal baking pan with nonstick spray, and dust it (bottom and sides) with a little confectioner’s sugar. Pour the cold water into bowl of your stand mixer, and sprinkle the gelatin over the water. Set it aside to soften. 3. In a large saucepan, combine the granulated sugar, corn syrup, hot water and salt. Cook the mixture over low heat, stirring it with a wooden spoon, until the sugar is dissolved. 4. Turn up the heat to medium, and bring the mixture to a boil (without stirring it!) until your candy thermometer reads 240°F. This will take about 12 minutes, but you do need to use a thermometer to verify the temperature. Remove the pan from heat, and pour the sugar mixture over the gelatin mixture that's in the stand mixer. Stir it until the gelatin is dissolved. In a separate bowl and a set of clean beaters or a whisk, and beat your egg whites until they just hold stiff peaks. Add the egg whites and vanilla to the sugar mixture, and beat them until they’re just combined. Pour the mixture into your prepared pan, and sift 1/4 cup of confectioner’s sugar over the top of the marshmallow. Transfer the pan into the refrigerator, and let the mixture chill, uncovered, until it’s firm. This will take at least at least 3 hours, but you can leave it in the fridge for up to 24. Take a thin knife, and run it around all four edges of the pan. Turn the pan upside-down onto a large cutting board. Then lift up a corner of the pan, and use your fingers or a knife to loosen up the marshmallow block so that it falls onto the board. Cut into desired shapes and sizes. Sift the rest of your original cup of confectioner’s sugar into a large bowl, and add the marshmallows in batches, tossing them to evenly coat them in sugar. 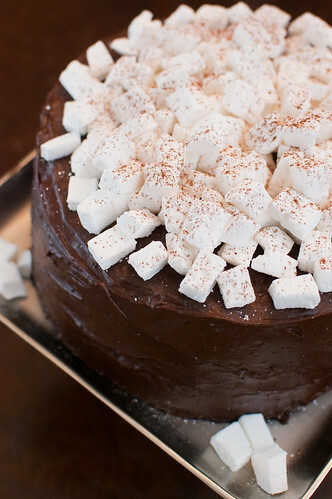 For this cake, I cut the marshmallows into 1/4-1/2 inch squares. I only cut about 1/3-1/2 of the batch though. The rest I cut into larger squares for snacking and gifting. To assemble the cake, remove the frosting from the freezer or refrigerator. Transfer to the bowl of a stand mixer fitted with the paddle attachment and beat on medium speed for 2 minutes to soften. Change to a whisk attachment and beat at medium-high speed until light and fluffy, about 3 minutes. Put a cake layer on a flat serving platter or a cake stand lined with strips of waxed paper to keep it clean while icing. Top the layer with 1-1/2 cups of the frosting, spreading it evenly with an offset spatula to the cake’s edge. Repeat with another cake layer and 1-1/2 cups frosting. Top with the last cake layer. Put 1-1/2 cups of the frosting in a small bowl. With an offset spatula, spread this frosting in a thin layer over the top and sides of the cake. Refrigerate the cake until the frosting firms enough to seal in the crumbs, 20 to 30 minutes. Spread the remaining frosting in a smooth layer over the top and sides of the cake. If necessary, you can rewhip the remaining frosting to loosen and lighten it. Remove the waxed paper strips. Mound the marshmallows on top of the cake (you’ll need only a third to half of them). Sift some cocoa powder over the marshmallows. You can bake, cool, wrap, and store the cake layers at room temperature for up to 1 day or freeze for up to 1 month. You can refrigerate the frosting for up to 3 days. The assembled cake can be refrigerated for up to 4 hours (return to room temperature before serving). Wrapped well, leftover marshmallows keep at room temperature for up to 1 month. I have never made mallows from scratch. Think I might have to try it. I saw this on the cover of Fine Cooking and almost started salivating! You made an excellent choice, the cake looks divine, and I'm sure it tastes even better :) I'm totally intrigued by the frosting method, too! I'll have to give it a try one of these days. This looks sooo good! Chocolate and marshmallows are the best. I've been wanting to make this cake since I received that issue of Fine Cooking (as well as the other two featured in that issue). I'm actually making the Coconut Cream Cake for Christmas this year. Anyway, so happy to hear it was pretty easy to make. Yours looks fabulous! I'm absolutely in love with this cake! Nothing says winter like hot chocolate with a marshmallow in it...except for this. yum! 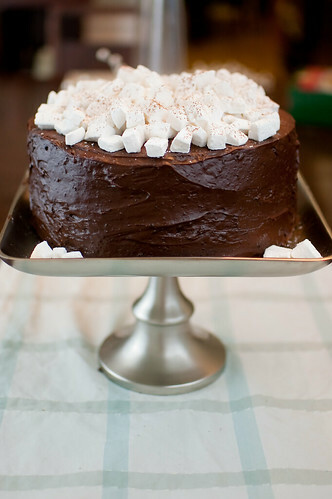 I love chocolate cake and this one looks so rich and delicious! Check out my blog at oatsnchocolate.blogspot.com. I love following your blog and would love if you'd follow mine too!